This City Tour of Miami will take you to the heart and soul of this vibrant city. 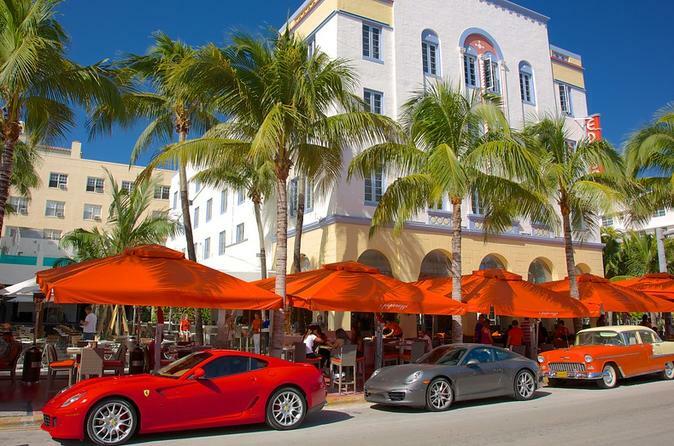 You will visit the cities of Coral Gables, Little Havana, Coconut Grove, the Art Deco district in South Beach and more. This is the perfect option if you are looking for a tour that is conducted in English, French, Italian or Spanish. If option is selected, take a leisurely cruise along the crystal clear waters of Biscayne Bay. Look for local marine wildlife, like friendly dolphins and manatees, as well as celebrity homes, and more. Local hotel pickup and drop-off included. The Miami City Tour is a must-see event while staying in the "Magic City". You will be picked up at your hotel and escorted by an extremely knowledgeable and professional guide. Interesting facts and details will be shared with you in your language, no headphones are used! The tour will begin on Ocean Drive, where you can experience first hand the flavor of South Beach’s culture. Drive past the stunning Versace’s Mansion. The influential art design style of Art Deco is evident in the colorful buildings making this particular area an authentic architectural experience. You will then head toward Downtown Miami City where you will have a direct view of one of the best skylines in the world, famous for its evening illumination of vibrate colors. The busy financial district boasts elegant skyscrapers with impressive modern architecture. The next destination is the original chic, touristic neighborhood of Coconut Grove. This is the place where Miami was first settled, maintaining its luscious vegetation and where modern day buildings give space to the flora filling the air with a fresh, wild fragrance. You will continue your journey to where the landscape turns into that of a typical postcard of Miami, the city of Coral Gables. This city mixes the typical residential American style with a touch of Spanish architecture. Your tour experience will end in Little Havana. Here is where the Cuban exiles gathered starting in the 1960's. You will witness the vibrant Cuban atmosphere at the Domino Plaza, where you can sip a typical Cuban Coffee while listening to the melodic musical notes of Cuba. If option is selected, here you will hop in a boat to cruise the crystal clear waters of Biscayne Bay. Along the way, watch for local marine wildlife — like friendly dolphins and manatees — and take time to admire the mansions of the rich and famous, including the former home of the infamous gangster Al Capone, and many other celebrities and well-known personalities.